This article will discuss the pros and cons of the five main places to view a space shuttle launch. 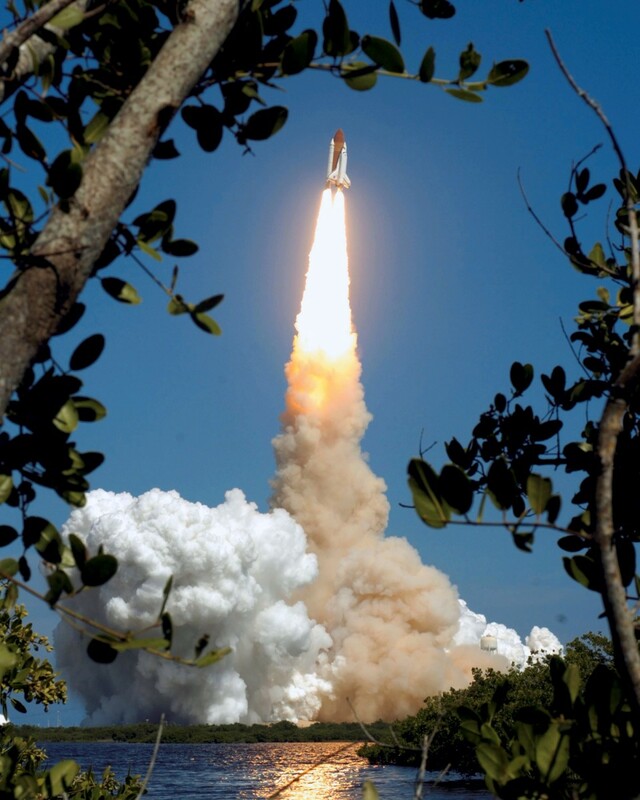 Where to go - the Kennedy Space Center or surrounding areas for the best Space Shuttle launch views? 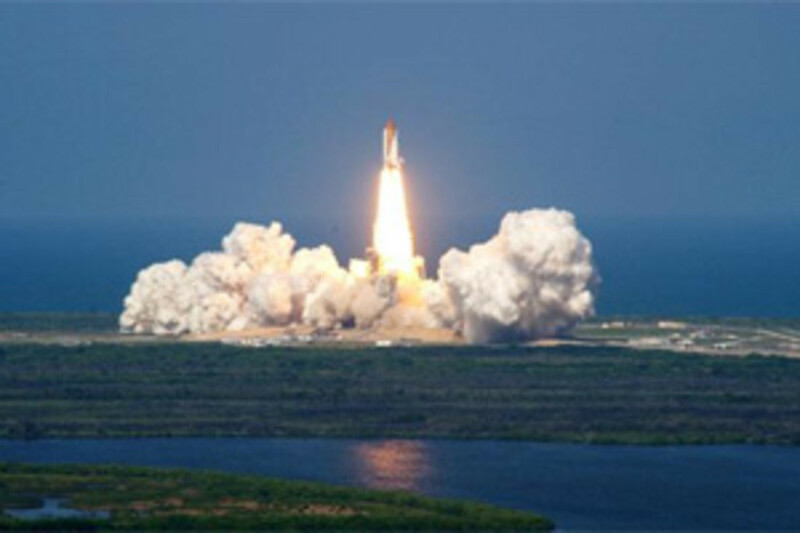 This article will show the best free and paid places to see a Space Shuttle launch. Your decision about where to view a space shuttle will depend on a few things. How much work do you want to do to get the tickets? How much money do you want to spend? (Some places are free.) Would you rather watch a launch from a strip of land with no bathrooms (causeway) or from a relaxing beach location near restaurants and hotels? Do you have access to a boat? Finally, do you have access to Congressional VIP passes, press passes, or passes for friends and family members of astronauts? Since space shuttle launches are often delayed, so a wise thing to do is to combine your space shuttle launch vacation with other Florida vacation activities. You can spend some time on the beaches while waiting to view a shuttle launch. Orlando, Florida, is about an hour away, and is a great place for a vacation. 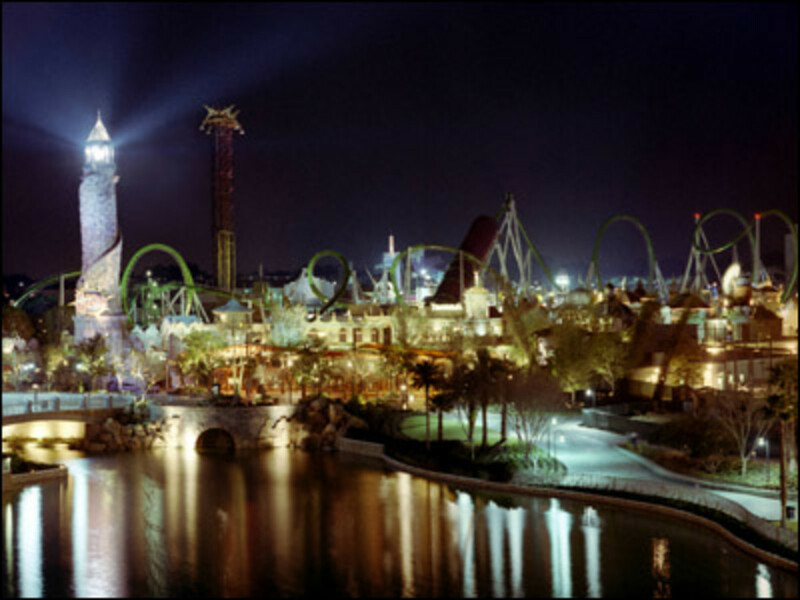 Walt Disney World, Sea World Orlando, and Universal Studios are just some of the popular Orlando vacation ideas. 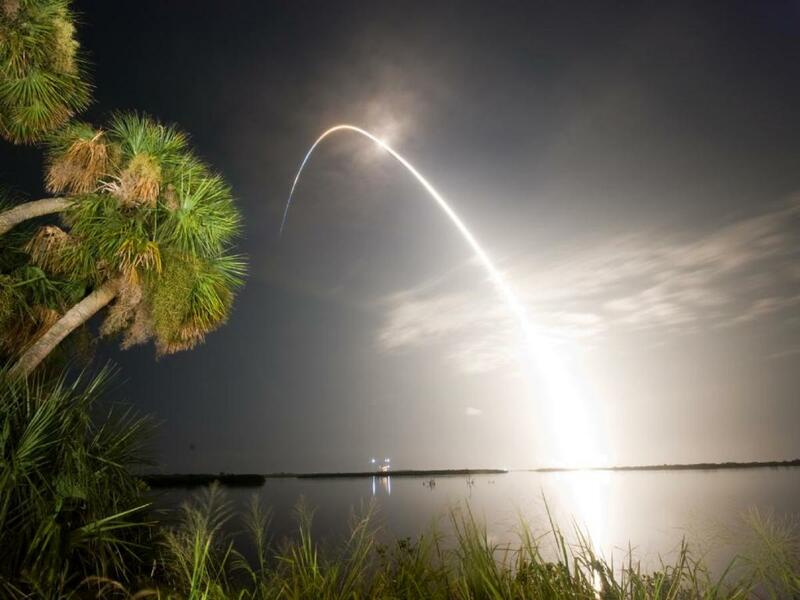 Titusville, Florida, is a great place to view a space shuttle launch. 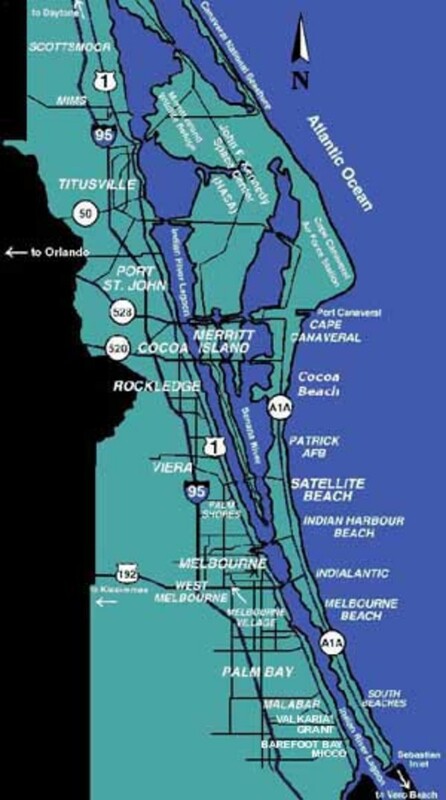 Titusville, directly across the Indian River from the Kennedy Space Center, is the closest city to both launch pads 39A and 39B. Most places in Titusville along the Indian River even have a clear view of the launch pad as well as the space shuttle as it launches. I strongly recommend seeing space shuttle launches from Titusville. Where in Titusville? Almost anywhere in Titusville along the Indian River, which runs along US Highway 1 from State Route 406 (Garden Street) at the Max Brewer bridge down to US 50, offers a is view across the water to the space shuttle launch pads. 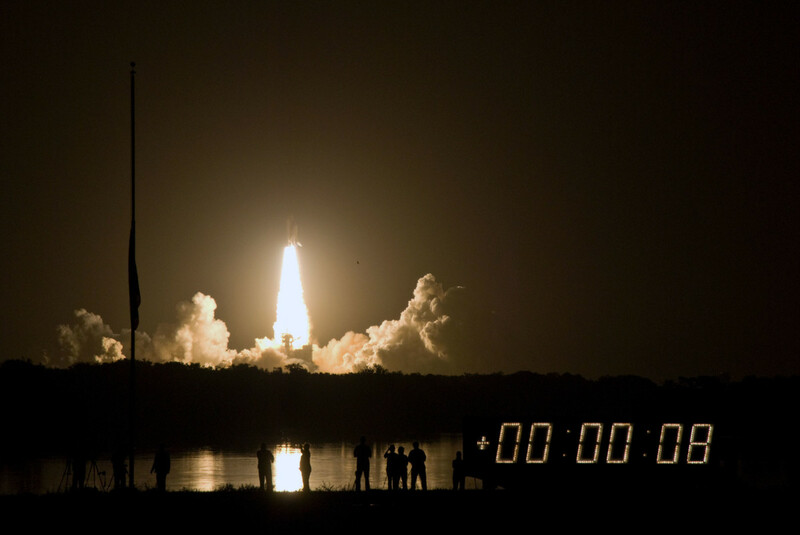 Titusville is also great for night launches, because there is a large body of water which reflects the light given off by the shuttle’s solid rocket boosters. A night space shuttle launch lights up the sky for miles around, and is a truly memorable experience. There are 6 parks in Titusville along the Indian River as well as nearby Jetty Park at Port Canaveral, south of the Cape Canaveral Air Force Station. Wherever you decide to go, the best advice is to arrive early to get a good viewing and parking spot. Some people living along the river also offer parking on their land for a fee. 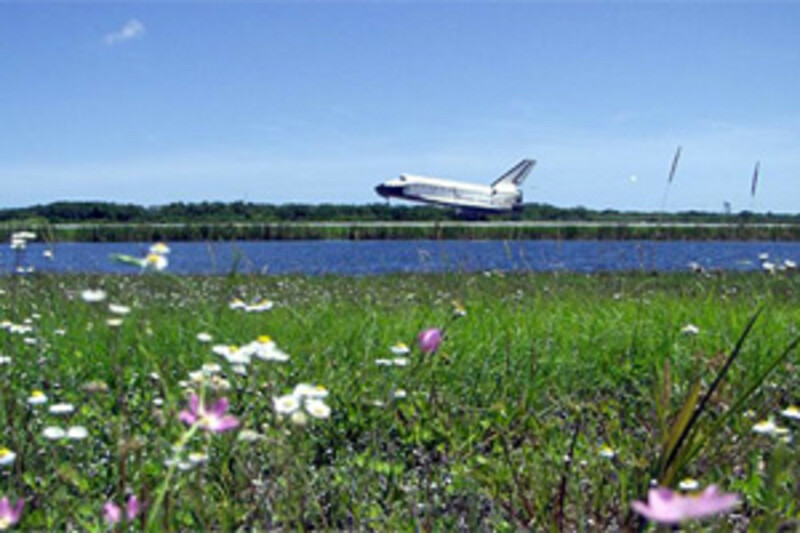 Space View Park in northern Titusville is the most famous park for space shuttle launch viewing. 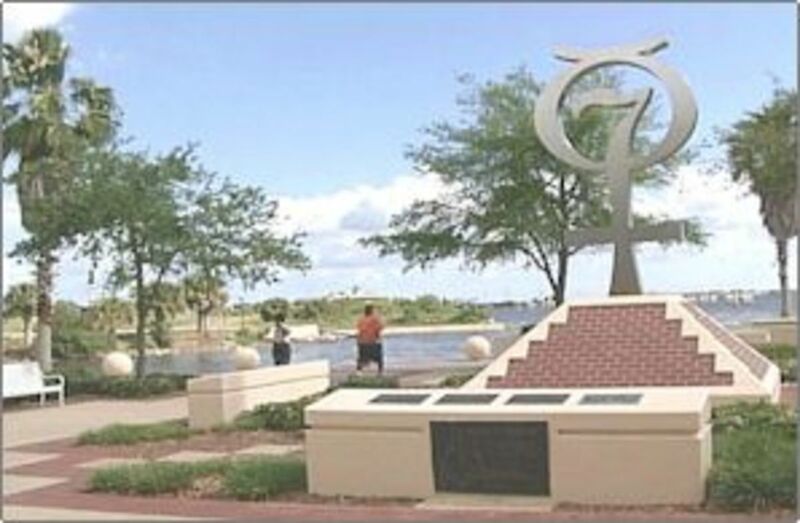 Space View Park is home to a Veteran’s Memorial and the Astronaut Walk of Fame. The Astronaut Walk of Fame honors America's astronauts as well as the men and women behind the scenes who helped America lead the world in space exploration, and is a good place to visit while waiting for the shuttle launch countdown. A live broadcast of the launch from NASA is normally broadcast in Space View Park, so people can all call out the countdown. Space View Park is located one block south of the 406 bridge. Jetty Park at Port Canaveral, south of the Cape Canaveral Air Force Station, is another good place to view a space shuttle launch. 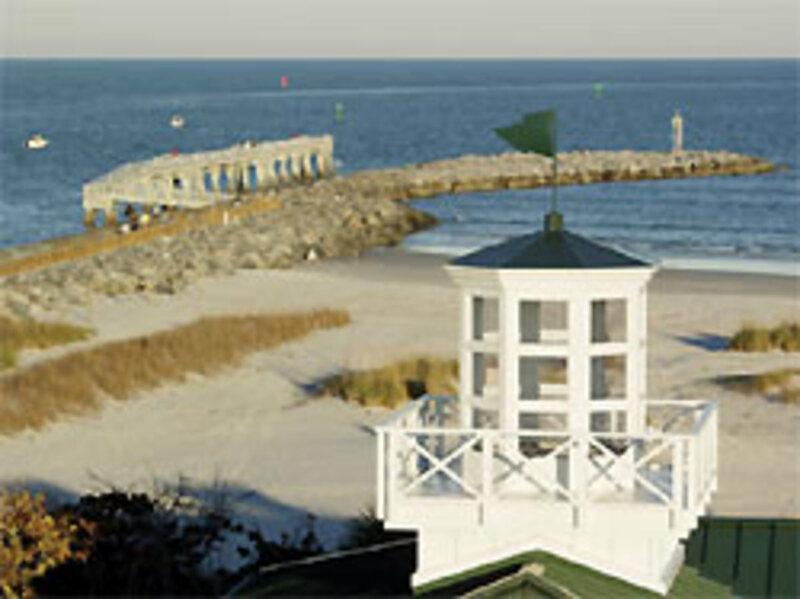 Jetty Park has a beach, campground, and fun activities. 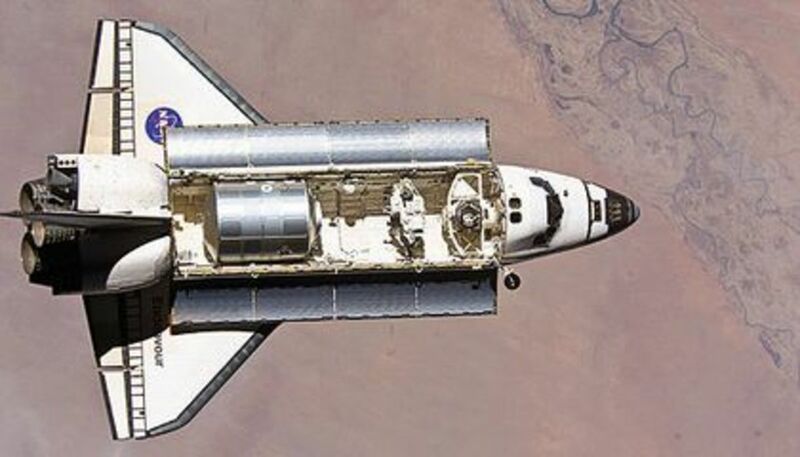 This article has the latest information on NASA's space shuttle launch schedule and summaries and photos of the last 6 space shuttle missions to the International Space Station. The NASA causeway, also called the Indian River Causeway West, is the closest place for the public to see a Space Shuttle launch. The causeway is a strip of road that runs across the Indian River. It is located on the Kennedy Space Center property, south of Launch Pads 39A 39B. 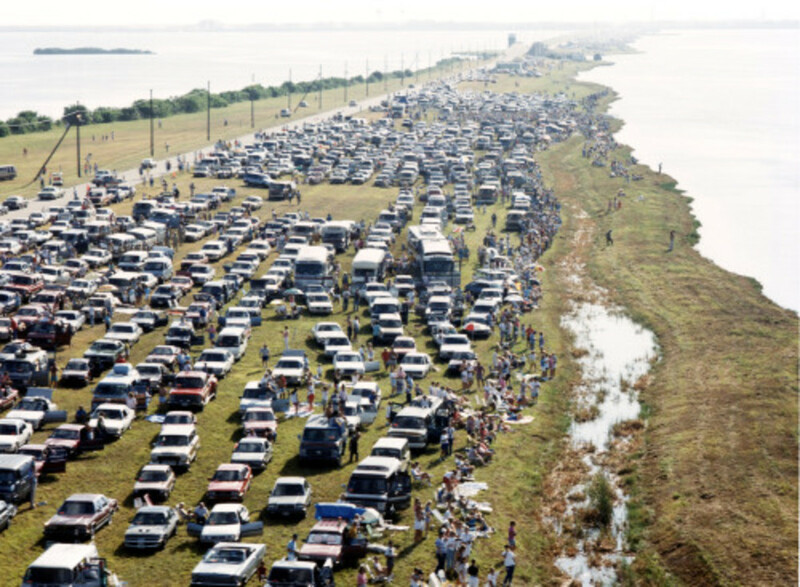 NASA used to give out free passes for private cars to drive to the causeway, but for security reasons this was stopped in 2002. 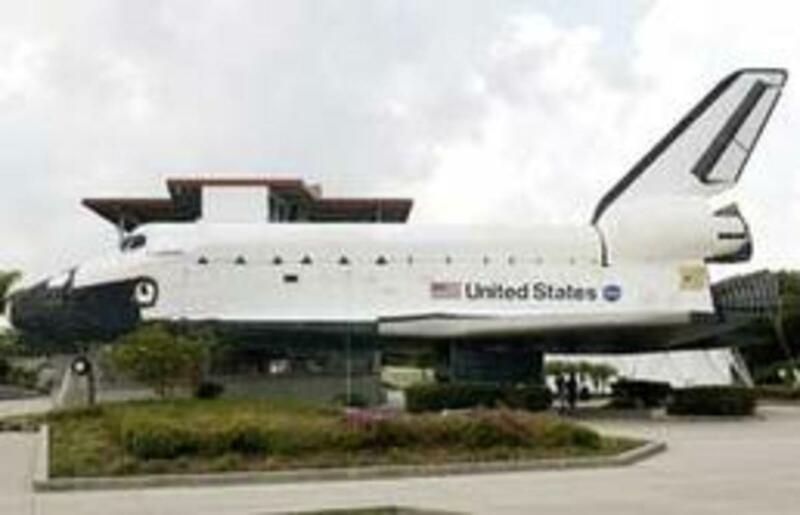 The Kennedy Space Center sells tickets for people to view a space shuttle launch from the NASA causeway and to view a space shuttle launch from the Kennedy Space Center Visitors Complex. There are rules that may allow people to go back for a postponed launch, but all launch tickets sold by KSC are non-refundable. If you want to get tickets on the NASA causeway, you have to get on an email list from the Kennedy Space Center months in advance. Some time before the launch, they will send you an e-mail saying when the causeway launch tickets will go on sale. 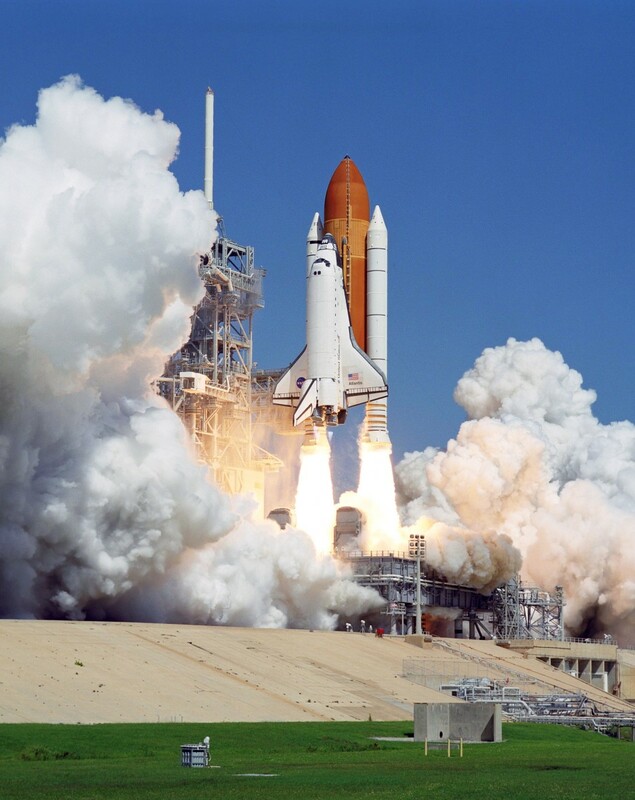 If you want to see a space shuttle launch on the causeway, you have to be ready to get the tickets as soon as they go on sale, as they may sell out within minutes. No visitors may take private cars on the NASA causeway. There are 2000-5000 visitors per launch who get on buses at the KSC Visitors Complex to see the shuttle launch from the NASA causeway. NASA causeway tickets are called Launch Transportation Tickets (LTT) or Launch Viewing Transportation tickets. A "NASA Causeway Launch Viewing Transportation Admission Package" is $56 for adults and $46 per children 3-11. The package includes admission to the Kennedy Space Center (KSC) Visitor Complex as well as a Launch Transportation Ticket (LTT) to view the shuttle launch from the NASA causeway. 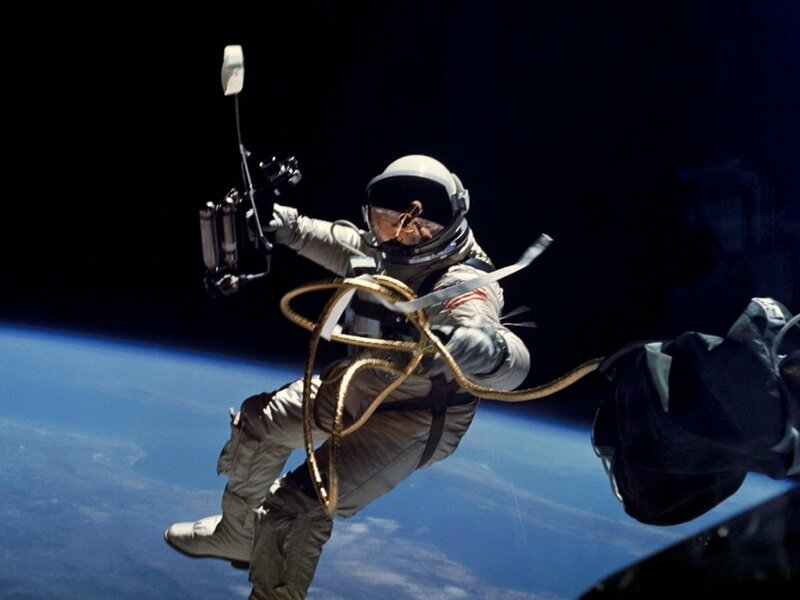 NASA also offers a package through two private tour bus companies. The package includes admission to the KSC Visitor Complex, launch viewing from the NASA Causeway, and transportation to and from locations in Orlando. The two private tour bus companies are Gray Line/Gator Tours Orlando and Florida Dolphin Tours. There are also Dine With an Astronaut packages that include the Launch Transportation Ticket (LTT) and everything in the NASA Causeway Launch Viewing Transportation Admission Package, plus a buffet meal with an astronaut. However, you may have to purchase a new ticket if the launch is scrubbed after you have taken a bus to the NASA Causeway, so this can be doubly expensive. The Kennedy Space Center Visitor Complex is the closest place to view a shuttle launch after the NASA causeway. However, it has no clear view of the launch pads because of obstructions. You will not be able to see the shuttle until a few seconds after launch. The Kennedy Space Center sells tickets for people to view a space shuttle launch from the Visitors Complex. You can view the exhibits in the Visitor Complex and surrounding grounds, but you can’t board the buses going to the NASA causeway. For people with small children who need to be entertained, watching a launch from the Kennedy Space Center Visitor Complex is a good choice because you can look at all the space exhibits and rocket garden while you wait for the countdown. 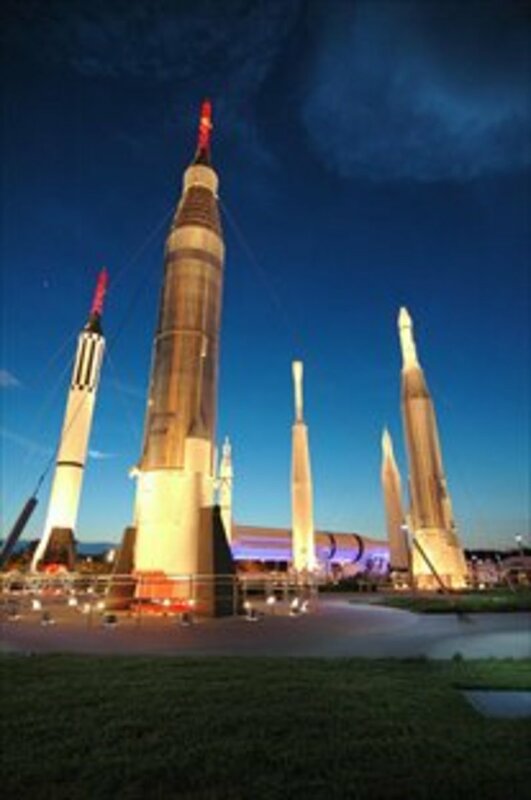 Launch Viewing tickets from the Kennedy Space Center Visitor Complex are $38 for adults and $28 for children ages 3-11. This package includes admission to the Kennedy Space Center Visitor Complex with launch viewing from the main Visitor Complex grounds. There are also have Dine With an Astronaut packages associated with KSC Visitor Complex viewing tickets. The Banana River Viewing Site is where the friends and families of astronauts and Congressional visitors get to view a space shuttle launch. 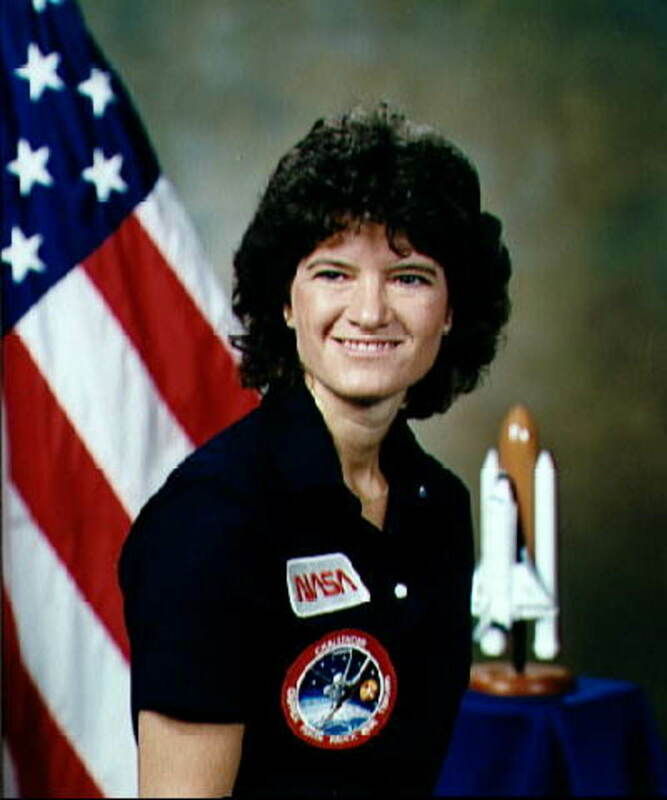 Write to your local Congress member or write some fan mail to a few astronauts and see if you can get an invitation. This area has a building with a cafeteria, gift shop, restrooms, and a small museum. 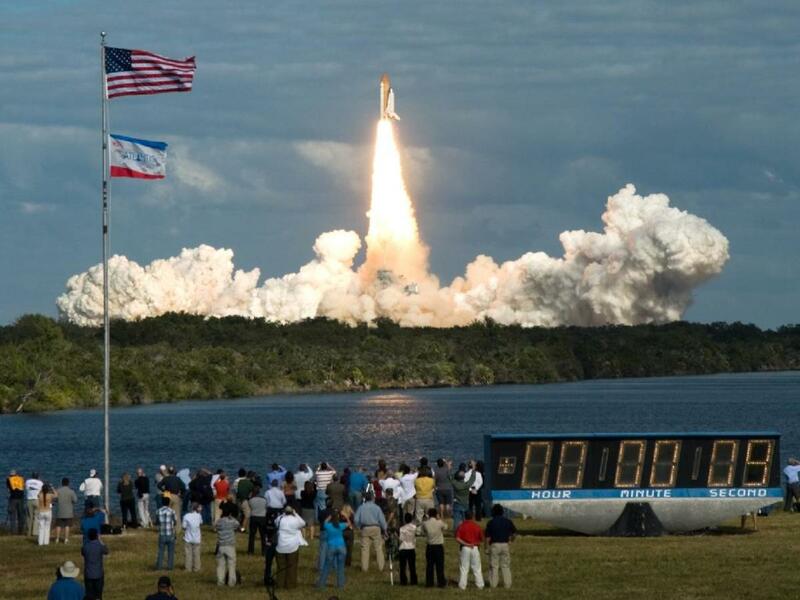 Many of the press photos of shuttle launches are from the Banana River viewing site. 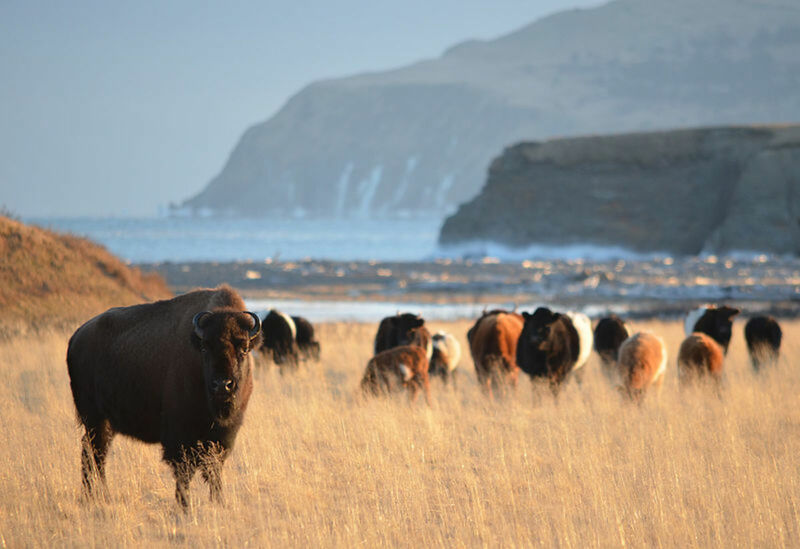 You will get an amazing view, but keep in mind that the photos you see are often by professionals are using professional cameras and lenses. The shuttle may look smaller when you are actually there. You can view a shuttle launch from a boat. Some people view the space shuttle launch from boats. While boaters may not set foot on any land that belonging to Cape Canaveral or the Kennedy Space Center, parts of the intracoastal waterway are open to boaters. Some waterways around the launch pad, and parts of the Atlantic Ocean where the solid rocket boosters drop, are restricted to boaters. Boaters also may not enter the southern part of Mosquito Lagoon. On the Banana River, viewers in boats will not be permitted north of marker 15. 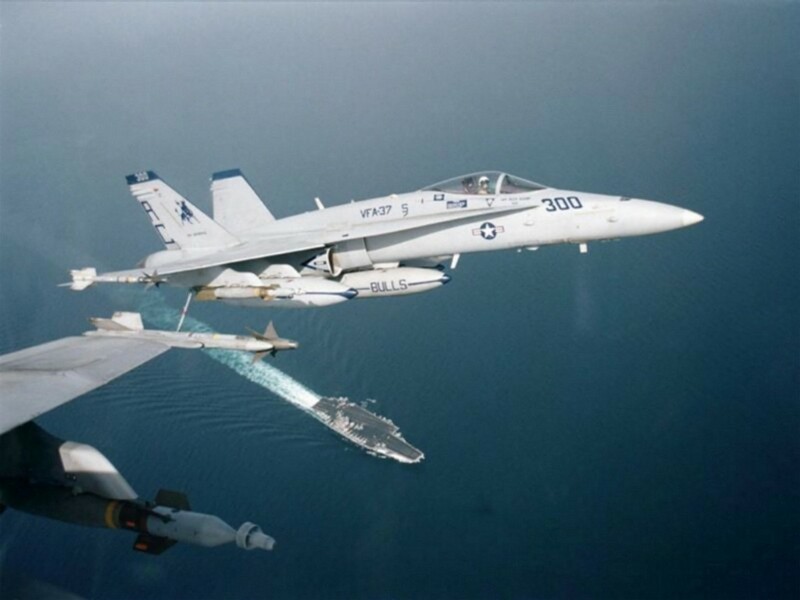 Boaters who want to view a space shuttle launch can tune into Channel 16 VHF-FM where the Coast Guard will broadcast instructions about restricted areas. Space Shuttle landings are usually more difficult to see than launches. There is no viewing area for the general public to see a space shuttle landing at the Kennedy Space Center. However, any of the good places to see a space shuttle launch can also be good places to see a space shuttle landing. Thousands watched the shuttle landing in Edwards AFB, California. The Kennedy Space Center in Florida is the prime landing site for all of the remaining shuttle flights. But sometimes, due to bad weather at KSC, the space shuttles don't land there. Early shuttle flights had planned landings at the Dryden Flight Research Center at Edwards Air Force Base in California. The space shuttle was the first spacecraft in history to plan to land in a controlled way on earth. Just in case there were slight problems, these early flights landed on a dry lake bed instead of on a commercial runway. 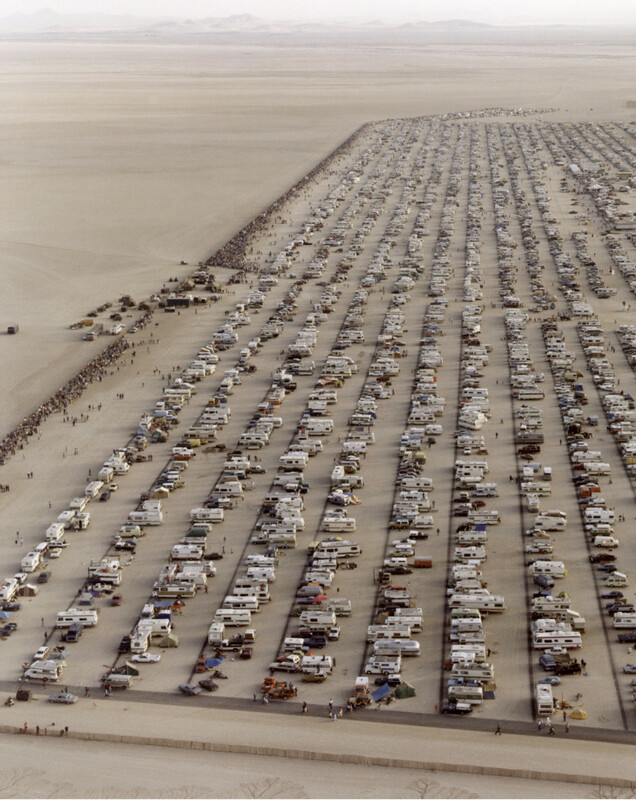 Thousands of spectators gathered on the parking lot and public viewing area of the Rogers Dry Lakebed to watch the space shuttle landings. Since no more shuttle missions plan on landing in California, there are no parking areas planned. However, if you hear that a shuttle will land at Edwards AFB, you may be able to drive close enough to the base and get a view of the landing. 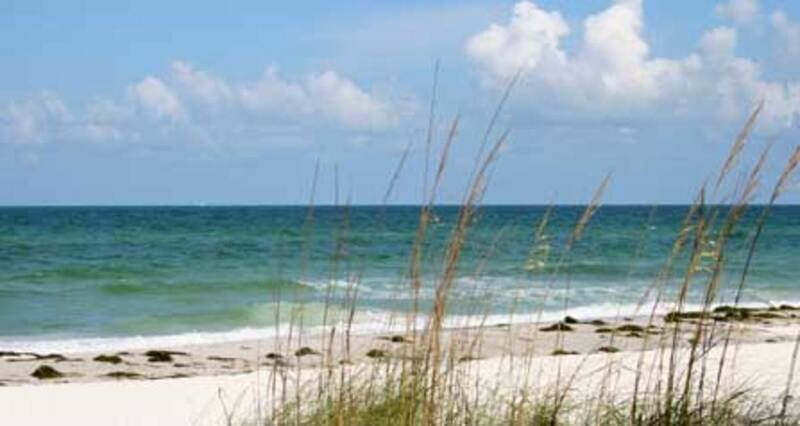 This site tells about Jetty Park and other Port Canaveral parks. This site has amazing launch photography and launch viewing information packets including directions to Titusville and the KSC Visitors Complex. 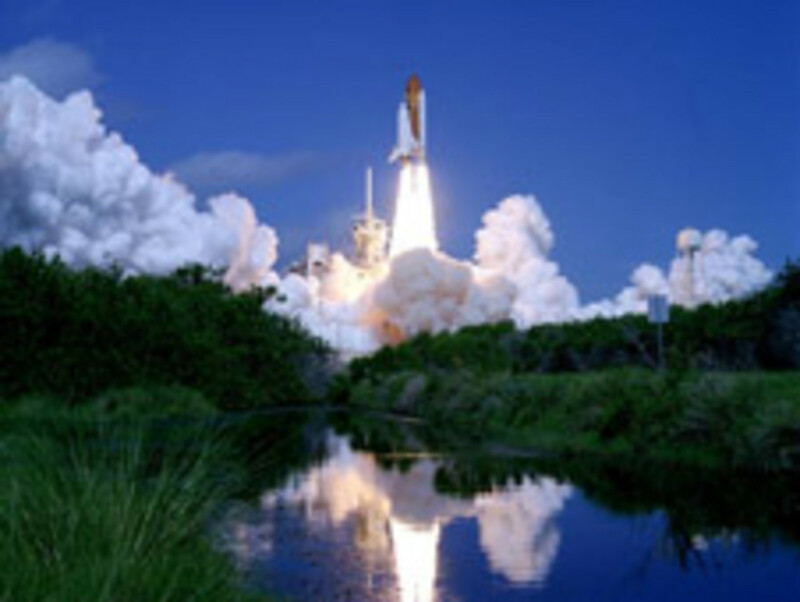 Get your official Kennedy Space Center space shuttle launch viewing tickets and witness one of the most amazing sights on earth. A live NASA space shuttle launch. Please Rate This Article Thumbs Up and Leave a Comment! Thanks for the great info on your site! 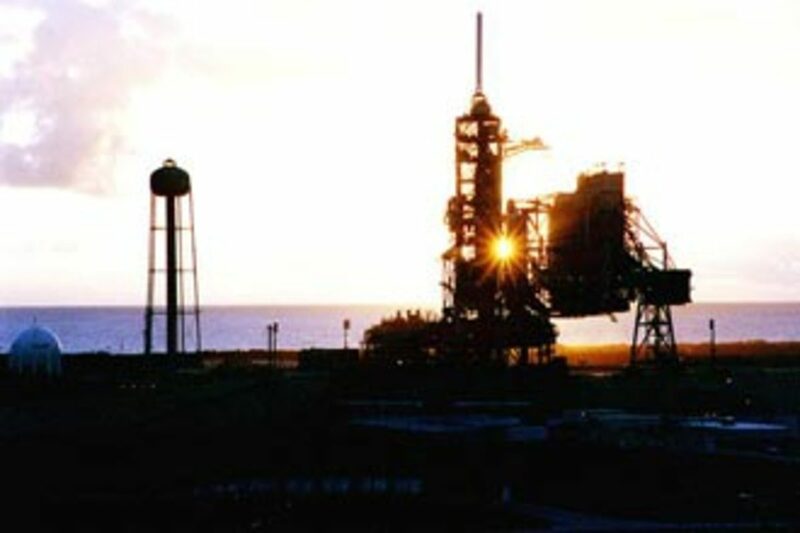 My friend and I just made a last minute decision to head to FL for the last launch next week, a truly historic occasion we should have visited long ago. We hope to get as close as we can without tickets. I've lost a few bids on eBay so don't hold out much hope of a great view, but if we can get a decent view of something and hear the roar with the excited crowds in Titusville we'll be happy! Cheers & thanks for the advice! I have been selected for the opportunity to purchase up to six (6) tickets to view the launch of STS-135 space shuttle Atlantis from Kennedy Space Center on Friday, July 8, 2011, at 11:26 a.m. ET. Launch viewing tickets will be available for purchase on Friday, June 10 from 9:00 a.m. through 5:00 p.m. ET. THESE TICKETS MUST BE PURCHASED ONLINE. Carol, again a great Hub. 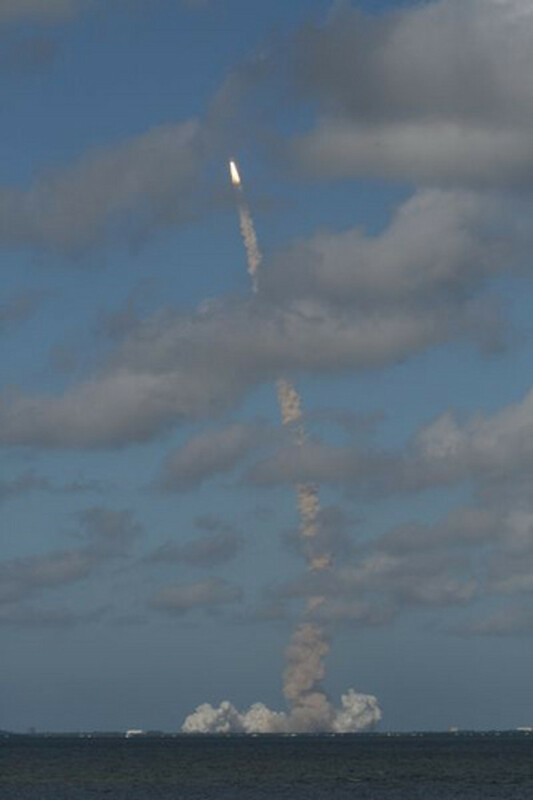 I was very fortunate and had the awesome opportunity of seeing the shuttle launch in Nov. '09. The experience is just so awesome. It is so hard to put the experience into words. I would have to suggest to everyone that they try to see this last mission launch in July because after that, that is all she wrote. thanks for the info im planning to see the April 19 launch at space view! should be an awesome time! any ideas on what time to arive there for a 7:30pm ish launch? anyway thanks again! Thanks a lot for all the effort in putting up this site! It's very informative! My family and I are looking forward to witness a spectacular show! We all wanted to witness a take off. I myself included. Wow, great info! Thanks! The only time I've been there was to board a cruise ship. Anyway, got to watch STS-132 from a great spot just south (a few hundred feet) of Space View Park in Titusville. To say watching a shuttle launch is AWESOME is an understatement! While Titusville is a bit far to really experience it, close up, it's still really some great show! Not to mention the friends I made from around the US that were there for the same reason. Arriving before sunrise made for a great and long day but a day well spent! Again, thanks for all the great info! Carol, many thanks for the hub. I've always been something of a 'space cadet' and for us Brits it was always a disappointment that we never had anything of our own, even if 3 Brits did go up with US citizensship, 1 went up with the Russians and we have another Brits who is being certified to go up as an EU astronaut/cosmonaut/whatever! I feel kind of sad that the Space Shuttle is not being replaced by an upgraded version, the Orion project seems to me to be a backward step. Best wishes and thanks once again. @Daniel I think that is a great choice. Get there early. Hey, this is really very useful information as we plan to watch the launch in March 2010. Our decision is now clear. We will watch it from one of the public places along Indian River. Thanks very much. I grew up in Melbourne Beach, close to Cape Canaveral, and watched satellites and missles roar overhead all the time. When I had a bookstore there in the 70's the shuttle passed by overhead. Quite a thrill.